GoAnimate's new Business Friendly Theme. The pre-animated character movements are quite varied and can be adapted to many different situations. Teamed with the most extensive range of props and backgrounds of any single theme on GoAnimate. There's a good chance you'll have to add very few of your own customized images. It's actually possible to make a promotional animation for your business in a matter of hours if you're super organized but, more realistically, you could have something done inside a week or two - depending on how many people have input on your work. Regular readers of this blog will know that as part of my design business, Art Time Productions, I offer my services to create GoAnimations for Business clients. Visit my Art Time Animation Page for details of my service and a playlist of animations that I've created for clients thus far. I can also help with writing a script if need be. 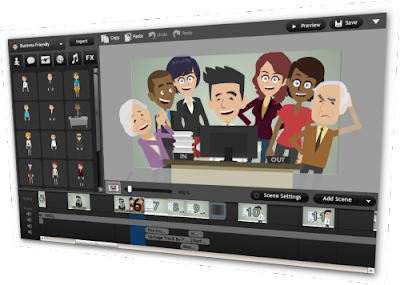 Why wait for up to four weeks to get an animation made, when you can have something up and running in less than two that is high quality but at a fraction of the cost with GoAnimate? In the current economic climate businesses need to save every dollar they can whilst still creating engaging promotional campaigns. Online video is a very popular and affordable advertising medium that can reach a lot of people very rapidly. A well scripted and skillfully made animation could easily bring the most value per dollar on a very minimal outlay compared to other avenues. If you haven't considered animation before because you thought it was too expensive then GoAnimate gives you a way into this promotional method without the price tag.